The Char-Broil Charcoal Gas Hybrid Grill is the ultimate hybrid grill, making it oh so convenient to grill with gas in the evening after work when it is so hot inside, you must throw those steaks on the grill but don’t have the time or the inclination to mess with charcoal. But then, on the weekend when you have time and want the great taste of char-broiled meat, you can put some coals and mesquite chips in the tray, and heat those up with gas. There’s absolutely no reason to hassle with lighter fluids or expensive pre-soaked charcoals. Then, once your coals are hot, turn the gas off, and put on the meat because you’re ready to grill and your guests won’t have to wait long. You’ll get 30,000 BTU’s from the main burners and 12,000 BTU’s from the side burner. The primary cooking area will allow about 545 square inches for all cooking needs while the warming rack has 175 square inches. There’s nothing like a hybrid charcoal and gas range for adaptable options. Quick and easy gas or the slow-cooked smoky flavor charcoal with mesquite, hickory, or even cedar chips for your ribs or beer can chicken, so juicy and flavorful. This grill is great when you don’t have a lot of room on the back patio but love to BBQ because you can still grill every evening and save those bigger grilling chores for the weekend when you have the time to use charcoal and wood chips. Not that it takes a long time to set up the charcoal, just put the charcoal and wood chips (if you like) in the tray, let the gas heat up the charcoal, then turn off the gas, and let the charcoal grill your meats to perfection. Another Char-Broil hybrid-type grill you might like is the Char-Broil Gas2Coal Hybrid Grill which is similar to this unit except you’ll need to convert the grill in three steps. The benefit is that the entire cooking surface can be either gas or charcoal as opposed to a split grill like this model. Click on link above to see the many features of this hybrid grill. It’s truly convenient to have a side burner to steam the corn-on-the-cob or some baby clams that are just so sweet but not big enough to grill. You can even put a covered pan on the warming area to melt the butter. You’re going to love that little side burner and prep area because now there’s no need to run back and forth to the kitchen to cut up those veggies or steam a side-dish. Cast-iron grates, which are porcelain-coated specifically for easy cleanup. Primary cooking area: 545 sq. in. Warming rack area: 175 sq. in. The Char-Broil Charcoal Gas Hybrid Grill is lightweight and has two wheels on one end that makes it easy to position on your patio or terrace. This is not a huge grill that’s difficult to position on the patio and takes up the entire space. This hybrid is more for the occasional barbecues of four to six but could accommodate a lot more with proper planning. Yet, even seniors or newlyweds with a small place love to BBQ and this is the perfect grill for them. We found 55 customer reviews on Amazon and the average rating was 3.7 stars out of 5 stars. 71 percent rated the Char-Broil Charcoal Gas Hybrid Grill either 4 or 5 stars. The concern with this grill came from purchasers who thought they were buying something they were not, a behemoth backyard grill, when, in fact, this hybrid grill is meant more for the terrace or patio. Yes, it is a hybrid with all the benefits of a gas/charcoal combination, but with a small footprint. 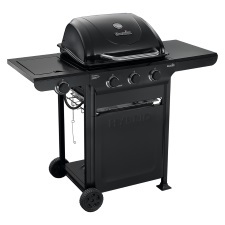 In summary, this hybrid grill is a convenient grill that fits comfortably on the patio or in a small backyard. You should not buy this grill for a large BBQ party, though if you get more guests than you expected you can still get a big meal done. But, this hybrid is meant for quick meals after work or a small weekend get-together of four to six. Keep in mind this is a small grill that you are not paying a big price for. Woodworking From Home: Can you earn a living? Read our 2019 Grill & Smoker Buyers Guide to help you save time, money and choose the proper appliance for your ideal situation.